The greatest name in American detective fiction is back! 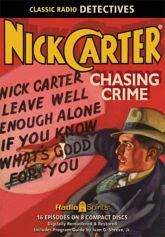 It's Nick Carter, Master Detective with a new collection of classic crime-fighting action. With Lon Clark in the title role there are eighteen mysteries to solve, eighteen adventures to unravel, and no limit to the thrilling excitement! The weekly knock on Carter's door brings cases of plagues and poisoned food, suspicious suicides and malicious murders! Charlotte Mason co-stars as Patsy, with John Kane as "Scubby" Wilson and Ed Latimer as Sergeant "Matty" Mathison.